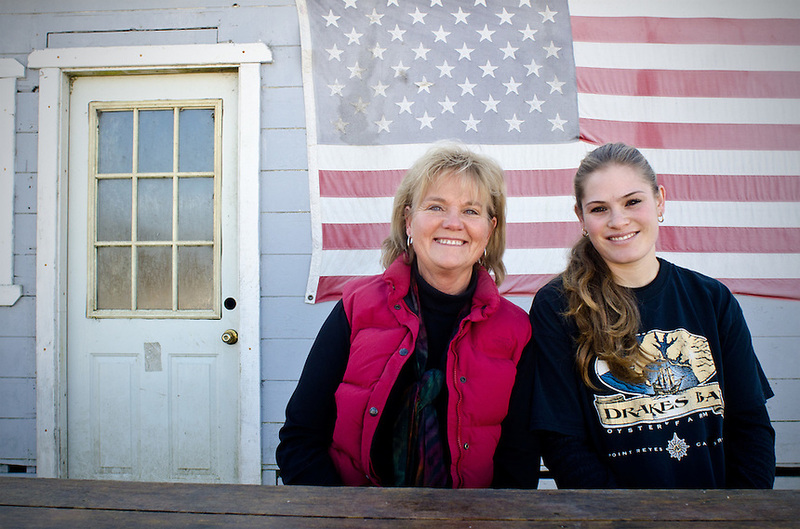 Farm manager Ginny Cummings and her niece Brigid Lunny pose for a photograph in front of a flag-draped storage building at Drakes Bay Oyster Company in Inverness, California on December 13, 2011. The Lunny Family owns and operates Drakes Bay Oyster Company and has been farming for four generations. The federal contract under which the Drakes Bay Oyster Company operates has recently expired. Now the Department of the Interior must decide whether or not to allow the sustainable oyster farm to continue commercial operations in a federally designated marine wilderness.